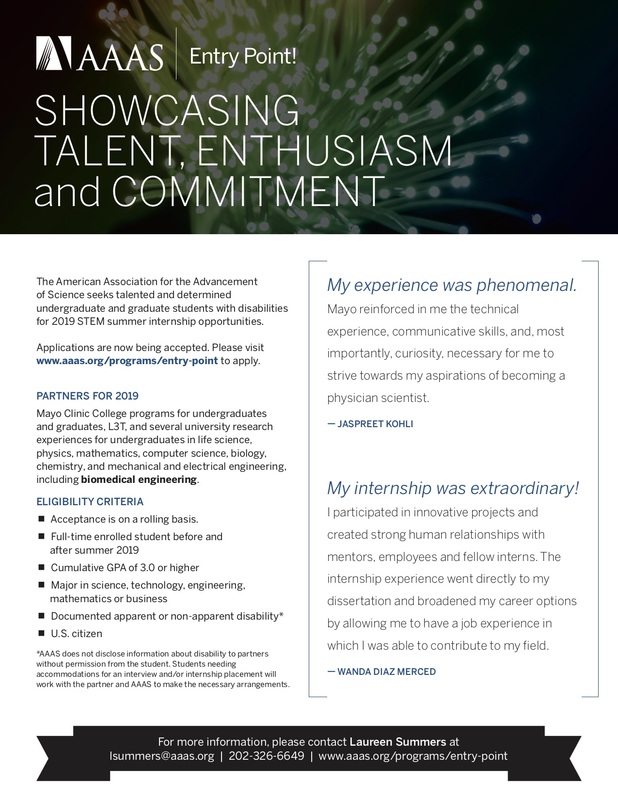 The American Association for the Advancement of Science seeks talented and determined undergraduate and graduate students with disabilities for 2019 STEM summer internship opportunities. Applications are now being accepted. Please visit www.aaas.org/programs/entry-point to apply. Mayo Clinic College programs for undergraduates and graduates, L3T, and several university research experiences for undergraduates in life science, physics, mathematics, computer science, biology, chemistry, and mechanical and electrical engineering, including biomedical engineering. Acceptance is on a rolling basis. *AAAS does not disclose information about disability to partners without permission from the student. Students needing accommodations for an interview and/or internship placement will work with the partner and AAAS to make the necessary arrangements.